North-East Nacho correspondent and raving Nachoist Amy sampled the triangles of glory at Varsity, Durham yesterday. Yes, Nacho Times just went Northern. Varsity bars are found everywhere from Leicester to Bangor (just not London) so you could say we’ve just covered the nachos in pretty much every county in the UK. You can’t even tell they’re northern. If you put these chos on a tube they’d stand in silence and inexplicably look at everyone’s shoes and everything. They probably wouldn’t eat McDonalds on buses either, or yell “EEEEH LAD I’M GUNNA VOM” in art galleries. I can make jokes like this because I am northern and can only hope it is taken in jest. Anyway. Amy sampled the above and came to the conclusion that they aren’t half bad. The composition is a bit off, with a glaring omission of guac, for which they’ve overcompensated with an overly ambitious amount of soured cream– but there’s a nice amount of jalapenos and the portion size looks promising. What isn’t promising, however, is the poor cheese coverage, wisping away like a poorly made toupe. Amy gives these Varsity chos a 3/5- though omitting the guac, and covering with a bad wig o’ cheese, she felt the amount of sauce and the portion size more than made up for it. So that’s that then. As you were. 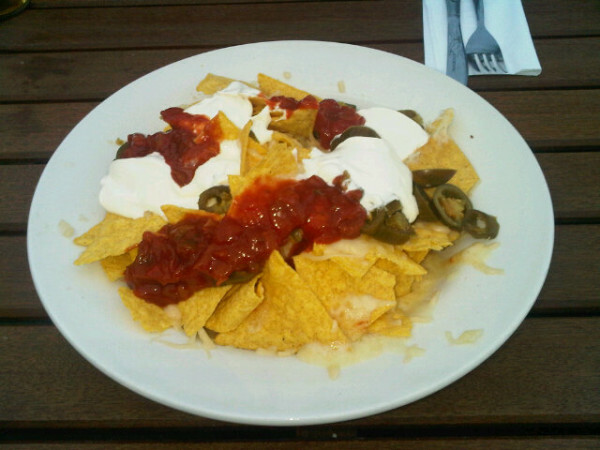 It’s been brought to my attention that my recent Nacho experiences have been somewhat lacking. It’s not all been for nothing- there are still some high scoring plates of coated triangulars out there- but the same problems keep arising. Nachos that are bald. No, it can’t be avoided but it can be alleviated. Layer your sauce throughout that angled yellow mountain (it’s really hard coming up with nacho synonyms, ok?!) or just be a little selfless with your condiments. Nachos that do not contain all of the Big Four. 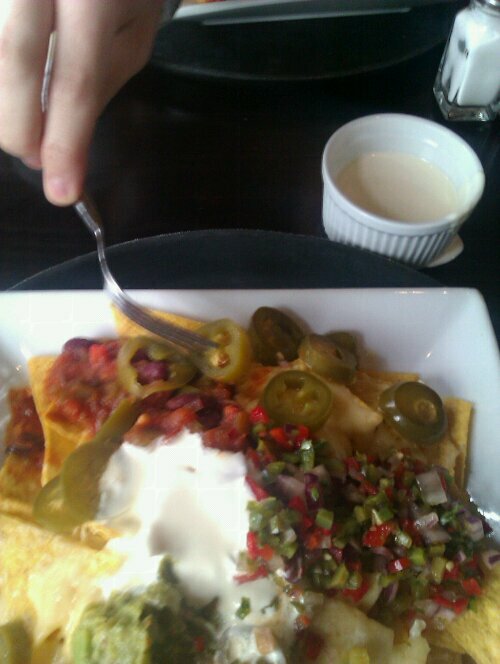 Salsa, Soured Cream, Guacamole, Jalapenos. Cheese is a given. Fanciful extras are charming, but substitutes (such as ketchup instead of salsa) are not. Fake cheese. If a man wearing a floorlength false beard constructed entirely of straw told you he had been cultivating it for ten years you wouldn’t refer to him as a bearded man. He would be a man with straw on his face. Same with nachos. If it’s not real cheese, it’s not real ‘chos. Just wanted to get this straight before the Ultimate London Nacho quest continued. Cheers. This shouldn’t be allowed to happen. 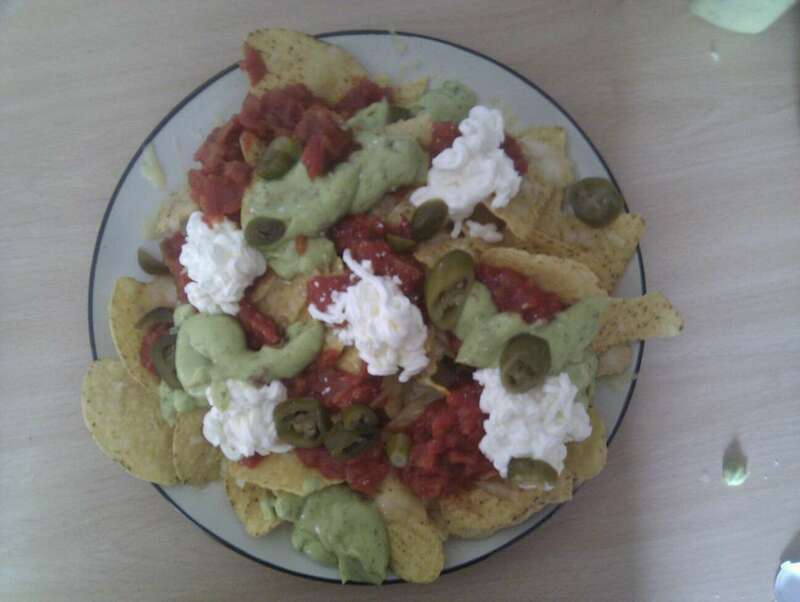 Just got tweeted a horrifying image of nachos resembling some sort of crime scene involving an axe, a maniac and a deceased pygmy’s giblets. Or dogfood. After it’s been thrown up by aforementioned dog. Okay so there’s no danger of baldness, but the whole thing looks like something you’d grout tiles with. And the strange transparent droplets on the bottom left of the plate don’t help either. Horrific. Classy plate though. 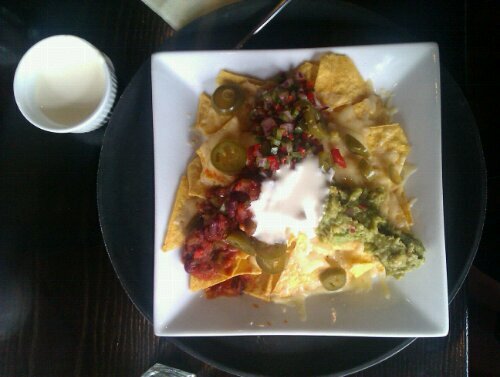 At £6.95 they’re fairly priced and you get the perfect amount of ‘chos. On a square plate. That the waitress had to put on a tray because it was heated. Yes, someone has circumvented the cold-after-three-minutes issue continuing to plague many perfectly good plates since the dawn of time. Talking of time, the chefs must have been preoccupied considering it took twenty minutes to serve what it ostensibly a fast meal to prepare. Maybe they were playing billiards. Just a thought. Either way, there were some some flair details and nice touches to these nachos so it was probably worth the wait. Note the separate helping of soured cream (which I poured on the middle for this picture because I was hungry and therefore impatient) so, in the words of the waitress, “you can decide how much or where you want to put it” HELLO POWER. Obviously- after this picture was taken- I used it all, and my lunch companions (Londonfood4afiver’s Katy and Joe) even gave me their jalapenos. Well, Joe did. But what about the nachos themselves? All the components were there, with some interesting extras such as a concoction of thinly diced pepper and onion. Plus, the salsa was homemade, chunky and delicious but unfortunately, there was not enough of it. The proportions were a little off and, after a few minutes, I was struck with the bald nacho syndrome. 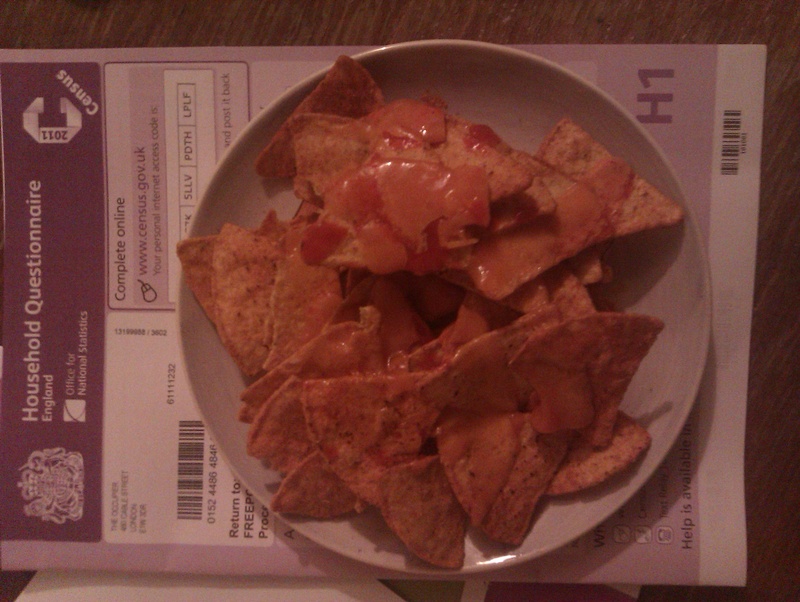 I had to do a bit of economising early on to make sure the sauce spread to those less blessed chips below. Even after the, quite frankly, aggressive amount of jalapenos kicking around the plate. Sometimes when times are hard, and there’s a census to complete there’s only one thing for it. Census nachos. NB: this is mostly all substitute ingredients. No salsa. No jalapeños. No guacemole. No soured cream. Tortilla chips. Cheese. Hot sauce. A National Census. Unfortunately, because of the lack of vital ingredients this does not come close to being the Ultimate Nacho. It was, however, a good stop-gap.